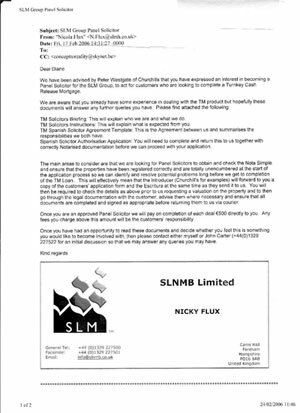 Interesting letter sent by Nicky Flux, from SLNMB, setting out the requirements to become one of their Panel Solicitors for representing them in signing up customers for their Turnkey Cash Release Mortgages. Alas, Nicky has forgotten to mention that they cannot operate in Spain because they have not duly applied for regulatory authorization! Nicky, you should have made your Panel Lawyers aware that your company furthered a type of banking “piracy” in Spain because your company robbed innocent people of their wealth and health, not to mention the implications of making peaceful British expats accomplices of a tax fraud scheme. Oh, we forgot to add that €500 to represent your company for acting illegally in Spain is hardly a fair emolument, SLMB’s so tight that it squeaks!